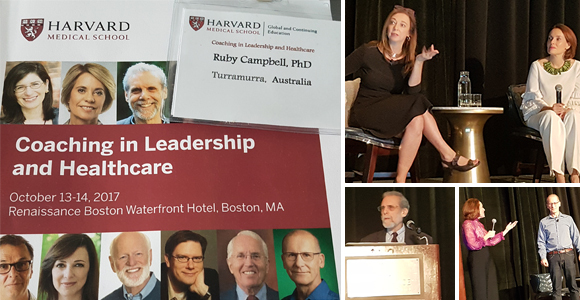 It’s been a rewardingly busy last couple of months, having just attended the Harvard Institute of Coaching (IOC) Conference: Coaching in Leadership and Healthcare, held in Boston in October. Meeting and learning from other passionate members of the leadership and organisational psychology/coaching community was an extraordinary experience for me. It was also fabulous to meet fellow coaches from over 21 different nations and I felt proud to be part of a strong Aussie contingent! The underlying premise of the conference was on physically and mentally preparing humanity for the new reality of the 21st Century: the Volatile, Uncertain, Complex and Ambiguous (VUCA) world we live in. From stress-related physical and mental illnesses, to the havoc (human and financial) caused by ineffective leadership, this conference helped create a compelling vision for the coaching profession from a scientific vantage point. Throughout the 2-day conference, keynote speakers were introduced, and workshops moderated by: Dr Scott Rauch (President, McLean Hospital and Prof. of Psychiatry, Harvard Medical School (HMS)), Dr Christopher Palmer (A/Prof. of Psychiatry, HMS), Dr Carol Kauffman (A/Prof., HMS and Founder & Director, Harvard McClean IOC), Dr Susan David (Co-Founder and Co-Director, IOC), Margaret Moore (Co-Director, IOC) and Dr Jeffrey Hull (Clinical Psychology Instructor, HMS and Director of Education & BD, IOC). 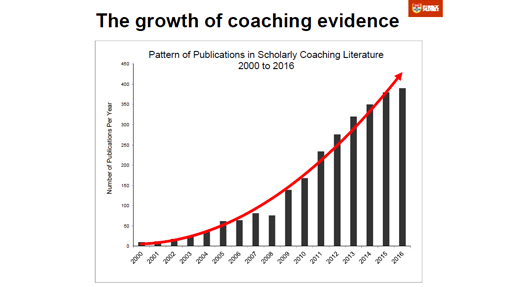 Our very own Dr Anthony Grant (Director of Coaching Psychology Unit, University of Sydney) gave quite an entertaining talk on the increasing body of evidence behind the effectiveness of coaching interventions (see his slide below), many of which were presented as workshops and scientific posters in this conference, and previous ones. One of the most enjoyable talks was by Dr David Peterson, Director of Google’s Centre of Expertise on Leadership Development and Executive Coaching (and clearly one of the reasons for Google’s astronomical success as they’ve made executive coaching a central aspect of leadership development). His high energy presenting style was matched by the high quality of his workshops’ content, as he explained the importance of learning agility and how it’s achieved. However, learning means nothing without action and change, and this can only be achieved by developing critical capabilities. 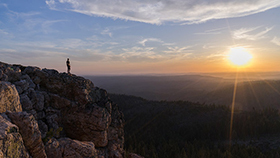 According to David, the critical capabilities for effective leadership in VUCA times are: 1) Cultivating empathy; 2) Managing cognition; 3) Fostering resilience; 4) Influencing others; and 5) Deepening self-awareness. 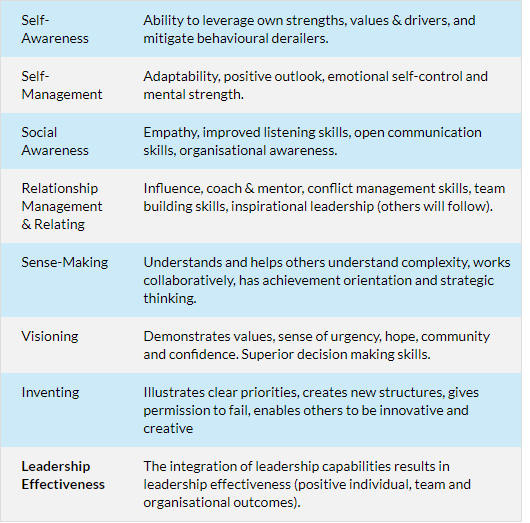 Key Capabilities for Effective Leadership in VUCA times. Speaking of change through coaching, it was an honour to meet at the conference Drs James and Janice Prochaska of the seminal Transtheoretical Model of Change (TTM), which is taught in MBA programs and Business Schools around the world. 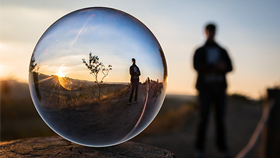 The iconic behavioural scientist, journalist and author, Dr Daniel Goleman (Emotional Intelligence, The Focused Leader, among others), presented his latest research on the pivotal role that practicing mindfulness has on our brain function. He likened it (mindfulness) to building mental fitness as we exercise the brain, mainly because the prefrontal cortex develops greater flexibility. This brain region has been implicated in planning complex cognitive behaviour, personality expression, decision making, and moderating social behaviour. Goleman’s findings further support the case made in the ProVeritas article “Should You Include Mindfulness in Leadership Development?” for mindfulness training in leadership development. And as suggested in the ProVeritas article, Goleman advocated for mindfulness training to be part of an evidence-based development program and measure the right outcomes for leadership effectiveness. Many health and wellness experts at the conference, and of course Google’s top leadership development and executive coach, David Peterson (see 2, above), also embed mindfulness practice in their coaching programs. It was therefore extremely reaffirming to be part of a global community of like-minded coaches. After the Harvard McLean IOC Conference, we’re now more excited than ever about our upcoming Executive Workshop on Rewiring Your Brain to Thrive in the 21st Century, specifically designed for Professionals, Managers, Directors, GMs and MDs. Please go to the page here to confirm your interest and that will help us decide on the best venue size and location. Leading in turbulent times is the new paradigm of the 21st Century, placing unprecedented demands on leaders. As an executive, you may feel as if you’re adrift in the world, working hard but not achieving something worthwhile, somewhere meaningful. Everybody has a coach. Or at least it’s getting to be that way; just ask a HR or business leader. "We seek to help our clients achieve positive outcomes and their individual and organisational goals by becoming their dedicated coaching allies in learning, development and growth. We provide tailored and cutting-edge coaching programs and HR solutions by partnering with business associates and suppliers who are committed to evidence-based coaching practice and have leadership experience in the corporate world." 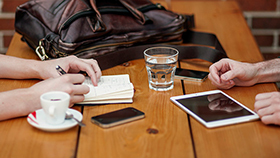 We respect your privacy and only mail to people who may be interested in our programs. If you wish to be removed from our list please unsubscribe using the link below.